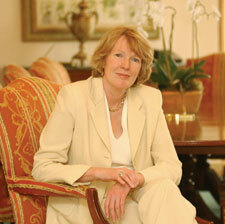 Margaret MacMillan discussed the new burdens on universities. Never has so much been expected of universities. It took a prize-winning historian to drive that message home to an audience in the Grey Nuns auditorium on Oct. 21. Margaret MacMillan, provost of Trinity College, University of Toronto, addressed a conference called Universities: Moving Ahead in the 21st Century , organized by Provost Martin Singer. MacMillan reminded the audience that universities were once “small and sunk in torpor.” Brilliant careers were made without their help, and no one expected them to be engines of economic growth, beacons of social change, or technological leaders. That has all changed, in large part because of the remarkable democratization of universities. This was a theme developed by Dean of Engineering and Computer Science Nabil Esmail, who traced the academy from Plato’s seminars through the 18th-century Enlightenment and into the 20th-century baby boom. MacMillan said that since the 1960s, society’s expectations “have put a great burden on us.” Universities have struck a Faustian bargain with government, and in her view, they are too cautious to bite the hand that feeds them by defending liberal democratic values. MacMillan is an expert on international affairs and the author of a brilliant 600-page account of the peace conference that divvied up Europe after the First World War (Paris 1919: Six Months That Changed the World). She has just been appointed to a post at Oxford, where she did graduate work. She said international trade and massive emigration are giving our world a new look. While some global links, such as those of non-governmental agencies, are beneficial, the world is now more fragile. The U.S. wears its superpower status uneasily, and the turbulence bubbles to the surface even at Concordia. In her view, we have been over-impressed by the big private American schools, whose own students rate their classroom experience far below that of the small liberal arts colleges. This remark was picked up by a Concordia professor, who said “some professors think the higher the number on the course, the more important it is, and the more important the person who teaches it.” The trouble is, several speakers said, universities are not tangibly rewarding teaching. Eva Egron-Polack is secretary-general of the International Association of Universities. Though she now works in Europe, she spent 15 years working for the Association of Universities and Colleges of Canada, where she knew President Claude Lajeunesse. She was critical of the rampant competition she sees among universities for research funding and students. The risk is that society’s needs are abandoned or skewed in the process. She also sees a paradox in the fact that universities are more powerful but receive less public support. As a result, they must look to private sources of funding, and try to make their managerial practices more efficient. Egron-Polack enthusiastically endorsed the well-worn Concordia catchphrase “real education for the real world” because it suggests educating the whole person, teaching respect for truth and diversity of opinion, fostering the joy of learning and teaching by example. Dean of Art and Science David Graham made a case for distance education. The number of university students is growing with “almost alarming rapidity,” and they are strikingly mobile. In fact, students are increasingly choosing to study in other developing countries rather than the West. Graham sees enormous potential in Internet courses to reach these students around the world. Journalism professor Ross Perigoe, who is getting a PhD from the Royal Melbourne Institute of Technology, said Australian universities are rapidly developing and opening satellite campuses in Southeast Asia. Others were not so sure. Liselyn Adams, who has just returned from a trip to China as Vice-Provost, International Relations, asked why we always talk about reaching out to these countries when it could be a two-way street.